Would you walk through the door of gold, into the world of shadows. You can leave behind any thing, everything. Bring only what you can carry. If your heart is filled with courage and you are worthy. Peep through some other doorways at the DPWeekly Challenge – Doors. This entry was posted in Celtic, change, mythology, photos, spiritual, unconscious and tagged awaken, change, doors, DPchallenge, fantasy, life, magic, myth, otherworld, philosophy, photography, spiritual, transformation. Bookmark the permalink. Inspiring poem. I enjoyed reading it. I think is beautiful. You are lucky to be an artist with the images and words and have such a great results! fabulous photo and beautiful words. and i’d not mind having that as my front door, either. It’s the main door of the church in the grounds of Dalkeith Palace, so plenty of Royal feet will have crossed its threshold in the past. Glad to hear you liked the post. 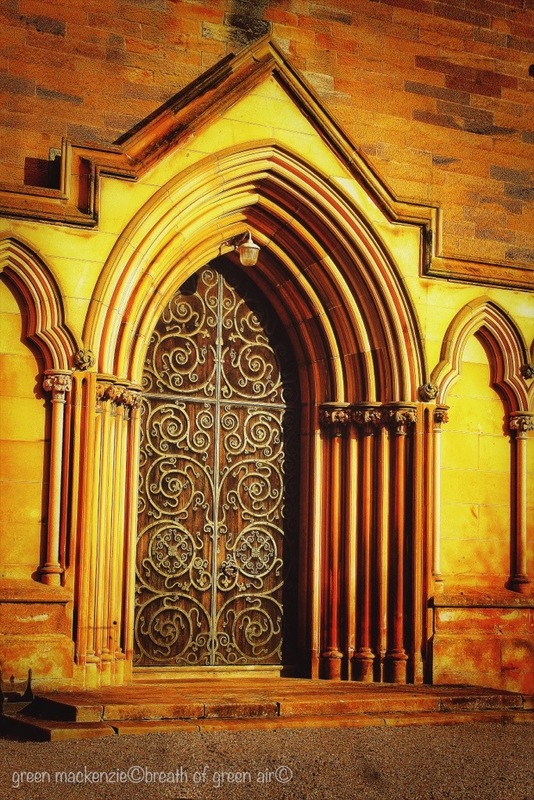 Thanks Amy, the ironwork on the door is really beautiful and so intricate…it always catches my eye as I pass it. BEAUTIFUL SENTENCES! Really write much for OM.UŞA that opens before us the native people will be the EC-WHO will close once. But behind them will leave a huge room to survive ONE FOR FUTURE. It was a pleasure to discover THANK YOU SO MUCH! This really is like a golden portal to another world with that luscious light and gorgeous details. This door always makes me think of Lord of the Rings and the elves Fi. Im glad you agree. I really enjoy how you combined the detail of the building and door, and the lightening. This is really gorgeous. Very nice Seonaid! But what weekly challenge is doors? Is it the DP challenge?? Thanks Tina. Yes, it’s this weeks writing challenge….but my link back seems to be refusing to work! P.S. Don’t know if my other ‘Likes’ have come through as wordpress tries to run me around a bit, but I do enjoy your breathofgreenair. I love how you use the door as a metaphor. I, too, have a door that brought out a poem with lots of existential questions. One of these days, I’ll post it on my blog. Thanks :-)….so do you dare?